This iconic tale has influenced pirate lore since it’s publication in 1883. Tropes such as peg-legged captains, parrots on the shoulder, X marking the spot, and the above sea song “Dead Man’s Chest” were creations of Stevenson’s imagination that have since been seen time and time again. Treasure Island recounts the first person narrative of Jim Hawkins, a teenage son of a innkeeper. While tending the bar, he got to know a little about an ol’ seafaring man named Billy Bones. The captain hires Jim to keep watch for a man with one leg, admitting that the man has a lot of interest in his sea chest. After Billy Bones succumbs to a stroke caused by a life of too much rum, Jim and his mother open the sea chest to find a journal, riches, and a map. Conferring with the resident doctor and magistrate, Dr. David Livesey, and the district squire, John Trelawney, about the contents of the chest, they deduce that it is a treasure map. Trelawney proposed buying a ship and following the map, and the doctor and Jim agree to go on the adventure. Rounding out their crew, they hire a cook for the journey, a man named Long John Silver, and a captain named Alexander Smollett. Though Captain Smollett doesn’t like the crew, they set sail on the Hispaniola in the hopes of finding the promised treasure. Along the way, Jim overhears Silver making a plan for a mutiny. He relays what he overheard to Captain Smollett, Dr. Livesey, and Trelawney. They plan to not do anything until after the treasure is found because they were outnumbered by the crew. When they land, to avoid any suspicion, Jim makes the decision to go ashore. There, he meets Ben Gunn, a man who was marooned on the island three years before. In exchange for a boat ride home, some cheese, and part of the treasure, he agrees to help Jim against the mutiny. The rest of the men- Trelawney, Livesey, Smollett, and their few small faithful crew- come ashore and hole up in an old stockade, abandoning the Hispaniola. Silver has commandeered the ship, running up the jolly roger, and demands that Smollett and his men give up the treasure map. Refusing to surrender the map, hell breaks loose. The pirates attack the stockade under Silver’s orders, and Smollett is hurt in the attack. The pirates eventually retreat, and while things are settling, Jim runs off to steal the Ben Gunn’s homemade boat. He cuts the line to the ship and floats adrift overnight while the ship floats out to sea. Eventually, he catches up to the ship, and when he climbs aboard, he finds that the two men left to control the ship are badly hurt. He rallies them in order to get the ship back to the beach, but they try to kill him- and in turn, kill themselves. Eventually, Jim gets the ship back into a cove of the island, gets back ashore, and returns to the stockade, eager to relay that he has single-handedly and successfully commandeered the ship back from the pirates! Unfortunately, once back to the stockade, he realizes that Silver has taken that over, and he is almost killed, but Silver talks his men down. Then Silver explains that they had struck a deal with Smollett and his men- in exchange for the map and stockade, the doctor would help their men heal from the battle. The next day, Silver, Jim, and the men head in search of the treasure- only to find it almost completely empty. Again, hell breaks loose, and Jim and Silver make a run for it with Livesey and Gunn. Once alone they find that Gunn had already found the treasure and stashed it! So they proceed to load much of the treasure up onto the ship, and they head off, leaving a few of the mutineers marooned. Knowing they can’t make the voyage back without more crew members, they stop in Spanish America and pick up new crew members. While landed, Silver makes off with a bag of money and escapes! Unable to do more, Jim, Smollett, Livesey, Trelawney, and Gunn head back to Bristol. As entertaining as the story was, I found the writing a little difficult to follow. I had to keep going back to decipher what had happened, which made the quick pace come to a screeching halt. I also couldn’t stop mentally comparing this novel to Pirates of the Caribbean, because so many tropes in that movie came from this novel (or at least were inspired by it.) 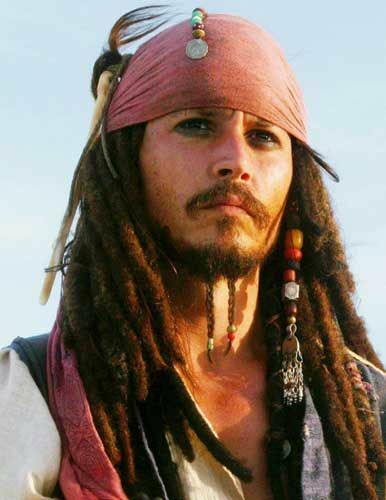 That was pretty distracting, because once you think about Johnny Depp, it’s hard to reel your brain back to reality. (No? Just me? Ahem well right, back to the book…) So I didn’t enjoy the read as much as I had hoped to, but it was worth my time to read it, in my opinion. Overall, it’s certainly worth reading at least once in your lifetime, so that you may get the full pirate experience, and well deserving of it’s classic novel status.